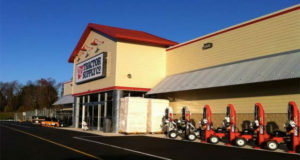 The new Tractor Supply store in Medford will have between 12 and 15 employees. Founded in 1938 as a mail order catalog business offering tractor parts to farmers, Tractor Supply is now a publicly traded company that owns and operates more than 1,600 stores in 49 states, according to its website. Its stores offer clothing, equine and pet supplies, tractor/trailer parts and accessories, lawn and garden supplies, sprinkler/irrigation parts, power tools, fencing, welding and pump supplies, hunting equipment, gun safes and accessories, ATVs, riding mowers and more. Tractor Supply reports annual revenues of about $6.8 billion. Mark D’Addabbo and Matthew Darling of New England Retail Properties are handling the development and leasing of the Medford site. Leo Farrell of Coldwell Banker Commercial Island Corporate Services represented seller Branchbrook Corp. in the property sale.